Today I woke up early and headed to the DMV to get my Florida driver's license! I got there 5 minutes after the DMV opened at 8:05 am, but there was still a 20 person line out the door. That's just Miami for you, I think. This NEVER would have happened in Connecticut, that's for sure! Despite waiting for about an hour and a half, the process was pretty painless. I was only outside for 10 minutes, I waited in several different lines inside for about 10 minutes each - the workers were friendly and they broke up the waiting by having you constantly moving lines to get another part of the application done. And the best part?? My picture turned out good! I can really live with it for 6 years, lol! On my drive home, I heard on the radio that this weekend (starting today, Friday) is Florida's back-to-school tax free weekend! I decided to head to the mall to try to find some white skinny jeans, a staple that I've been missing all summer long. Unfortunately, I found ZILCH at the mall. Nothing was in my size! 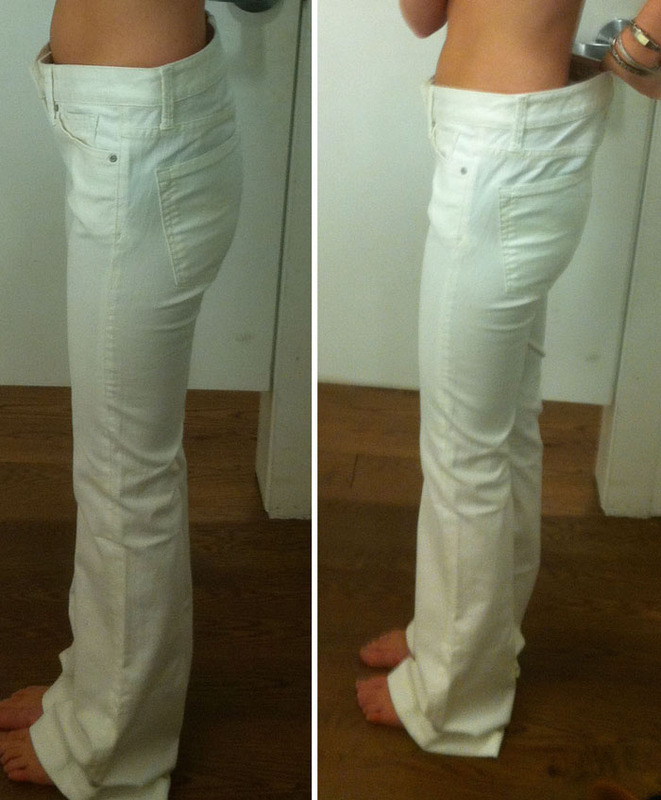 Finally at Gap, I found a pair of their jegging jeans in white in my size! I fell in love as I pulled them on, I already knew they would fit! But alas, some things aren't meant to be, because the zipper was broken and I didn't want to pay for the pants (minus a meager 20% discount for the broken zipper) plus getting a new zipper put on by a tailor for probably 20 dollars or more. Anyway, I also tried on some other pants and took pictures because they were probably the weirdest fitting pants I've ever tried on. That's typical Gap for ya (at least, for me anyway!). Gap clothes fit me so weird! The pants were almost too tight on my thighs and ridiculously large from the thigh up to the waist. It was hilarious. Oh and right as I was taking my pants off a stupid little boy crawled into my dressing room. I have a huge problem when parents can't watch their children or teach them to behave/have basic manners in public. However, good news for anyone who can fit into these pants: they were marked down to 14.97 plus another 30% off! That's some seriously cheap jeans! They had a ton of styles (including these white ones) in small sizes at the store near me, but I really really really don't need any more blue denim. Surprisingly, a few of the pairs fit very well but they were all sort of boot cut or flared bottoms which I have enough of already. Despite the great price I couldn't bring myself to get something I didn't need or really want. 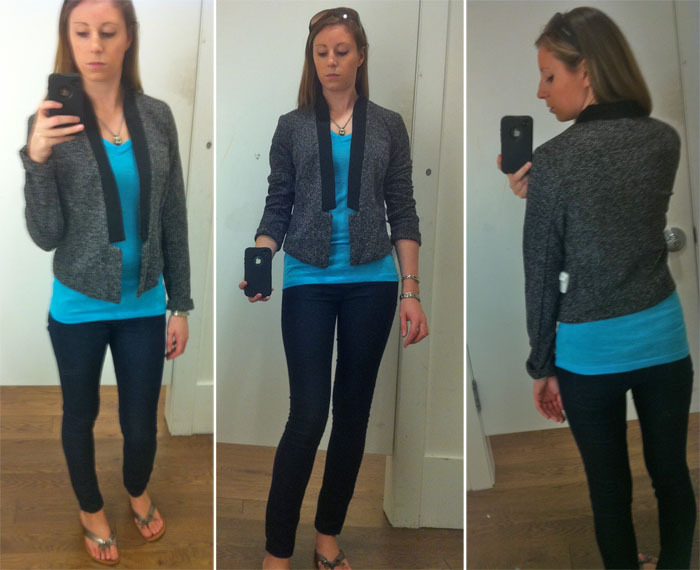 I did find this Gap Boucle Tuxedo Jacket (click link to find it online) which must be a part of the fall collection. I had just read a blog post about jackets that were not quite blazers being perfect for going out or for a more fancy evening, and I came across this baby and felt it fit the mold. The jacket is a tweed material and is sooo soft and not scratchy tweed at all. I also think I could wear this to work over a cute sheath dress, or exactly how I have it on with my shopping outfit on the weekend for dinner or drinks. The fit was pretty great for an XS from Gap-- it slightly grazed my sides and wasn't too big or too small. The sleeves were about 1 inch too long (left picture I rolled the sleeves up slightly), but it can be worn with the sleeves pushed up, too (center picture). It was 69.99, and I considered buying it for full price because of the tax free weekend on items up to 75 bucks, but gap always has sales and I know I can get it cheaper! I just hope I don't miss out on getting this jacket! Any other people's states reward their citizens with tax free holidays?? Did you pick up anything? Can't believe a kid crawled into your dressing room, crazy! That jeans is really out of proportion, wow! Wow, those trousers really look like they fit terribly!